This digital download is completely FREE! The download contains the game I Have Who Has in a super hero theme using Fry word List words 1-50. 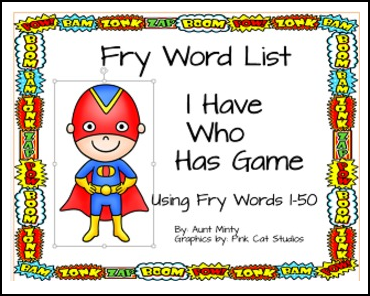 Download contains 15 pages with Fry words 1-50 cards. Great for small group and literacy center use. Great for ESL and ELL students. Simply print the cards off on card stock, laminate, cut apart and play! If you don't have card stock print the cards off on regular printer paper and glue to construction paper before you laminate.